Marriage is a time of new beginnings. But for a growing number of Syrian refugees in Lebanon, marriage has become a trap. Many of the Syrians have little money and are unfamiliar with Lebanese laws. They are often restricted in their ability to find someone to perform the marriage. So, growing numbers of refugees are getting married illegally. The result of unlawful marriages in Lebanon can have a lasting effect across generations. Children of such unions risk being left without legal standing and rights. A Syrian refugee named Reja talked to VOA about her experience in Lebanon. She spoke on condition that her family name not appear in this story. Having fled her home of Idlib in 2013, Reja said, the possibility of marriage arose suddenly for her. Her father told her marriage would be good for her. “I decided not to say no,” the 28-year old explained. It happened so fast. Within a day, she had met her future husband and, within two days, they were married. Yet, she knew something was wrong. “We could not get a sheikh at the time, so my father oversaw the ceremony and the handwritten contract," Reja said. Reja felt it was not her place, as a woman, to question the issue herself. But she was right to be suspicious. Reja at the offices of the Lebanese Council to Resist Violence Against Woman (LECORVAW) in Tripoli, Lebanon. Had Reja and her husband been married in Syria, the marriage would likely have been seen as lawful, as the laws there are not as restrictive. But in Lebanon, an unwritten contract and religious ceremony are not enough. The marriage must be performed with a registered Sheikh and get state approval, a process that can be costly. Though some Lebanese face the same problem, Syrian refugees are the group most affected, explained a lawyer named Ranin Osman. “Maybe they do not have the money, that’s one reason. Secondly, they may not be aware they have to do it, and thirdly they may be lied to by an unregistered sheikh,” said Osman. The costs of not registering a marriage can be severe. Reja told VOA that her marriage lasted a few years, during which time she was badly mistreated by her husband. Reja had enough of married life when she discovered he was preparing to marry another woman. That discovery led her to contact The Lebanese Council to Resist Violence Against Women. The council is one of the few organizations looking into the issue. 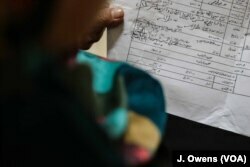 Reja decided to register her marriage so she could get legal permission to end it. Registering the marriage gave her the legally enforceable methods to demand child support from her now former husband. “I will be getting $135 a month for my two children, and that is so important for them,” she said. Reja holds the paperwork that proves she has legitimately registered the marriage. She had to register the marriage in order to get a divorce that allowed her to claim child support. The future of her children remains far from secure. Saraa Dannawi works at the offices of The Lebanese Council to Resist Violence Against Women in Tripoli. Dannawi explained that if parents failed to register their marriage, they cannot register the child. Registering children before they are a year old costs very little. But after the first birthday, the registration process can become more complex and costly. Ramy Israkhieh directs the Tripoli International Centre for Human Rights. He says the fact many Syrian refugees have little money is making the issue worse. “I would say there has been a 30 percent increase in people coming to us with this issue in the past two years,” he told VOA. The United Nations refugee agency notes that only 19 percent of refugee families reported all members had legal residency in Lebanon. That is down from 21 percent in 2016, it said. The children whose births remain unregistered face possible loss of rights to education, medical care and other basic services. They are unable to get a Syrian passport or other official documents, and cannot legally return to the country of their parents. Statelessness also presents a problem for the Lebanese government. More and more of Lebanon’s population is lacking in official documents. Statelessness presents a possible barrier to Syrians who wish to return home when the war ends. Reja worries about whether her daughter will be able to attend school one day. She fears her children will not be treated like other boys and girls because of their standing in Lebanon. John Owens reported this story for VOANews.com. George Grow adapted his report for Learning English. Hai Do was the editor.